Active participation in music fills important needs for adults – the need for challenging intellectual activity, the need to be a contributing member of a group, and the need to have exciting events in the future. 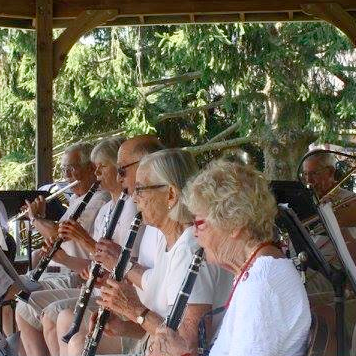 Launched in 2009, New Horizons at CMS under the direction of Patricia Hurley is a supportive group for beginners or those who have not played an instrument in years. There are no auditions and everyone is welcome! Rehearsals are twice a week with performances scheduled during the semester. Standard band literature graded level 2-3 in all styles and genres will be performed. Beginners may schedule private lessons in preparation for joining full rehearsals (additional costs apply). The New Horizons music program was introduced in Rochester, New York in 1991, the brainchild of Roy Ernst of Eastman Conservatory. Today there are about 150 New Horizons bands, choruses and orchestras in the United States and Canada, with thousands of participants. These organizations provide an entry point for adults who have either never studied music or who have been away from it for many years, allowing them to share the joyful experience of recreational music making. As it was first developed, members had to be at least 50 years old, but we have opened our program to any adults who are available between 10 and 12 on Monday and Thursday mornings for sectional and full band rehearsals. Read more at http://www.newhorizonsmusic.org/. We invite you to join the recreational music movement — you’ll be glad you did! Be a part of the New Horizons Band at Community Music School! For more information call 860-767-0026. Paddy founded Community Music School in 1983 in response to a need for local private music instruction to enhance the public school music programs. At the time, she was Director of Music at John Winthrop Junior High School, and soon thereafter, added the position of Band Director at Valley Regional High School. In 1991 she took a position as music instructor in the Scarsdale, NY schools, where she remained until 2005. Upon her return to Ivoryton, she found that CMS had grown considerably. She joined the Board of Directors and participated in a further expansion. Paddy is very pleased and proud that CMS is serving a large segment of our community and fulfilling a dream to make music education a viable part of the lives of its residents of all ages. Paddy teaches Mondays and Tuesdays.